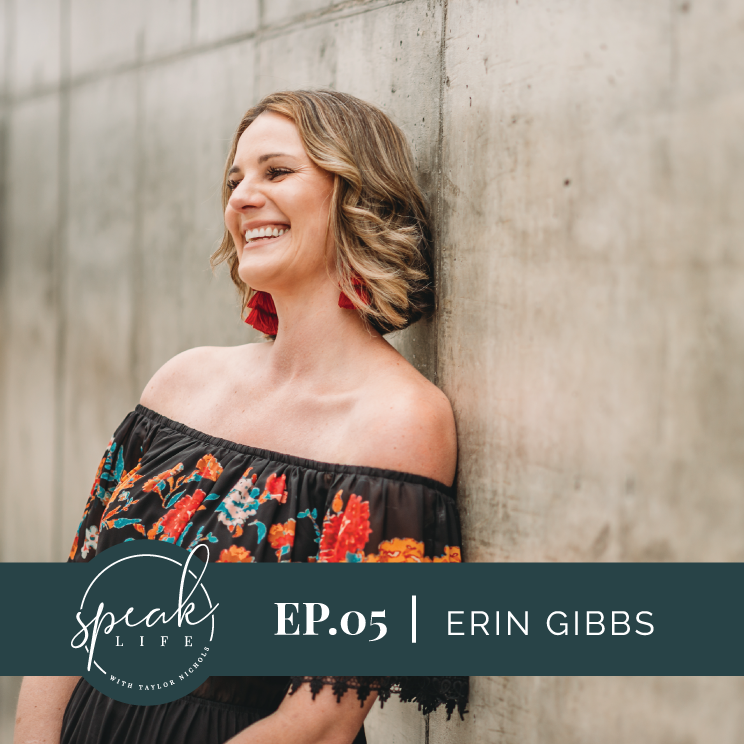 On today’s show, I am talking with my dear friend, Erin Gibbs. Erin grew her wings in Colorado, Boston, and California, but Texas called her back home before starting a family of her own. She and her husband, Garrett returned in 2009 and now, 10 years and three kids later, they are still here. I think it is fair that you know this was the VERY FIRST episode I ever recorded. It was one of those “let’s see how the equipment works” kinda conversations after I had finished a glass of wine. I agreed to sit down with Erin for my first Speak Life “interview” on one condition, that we would 100%, FOR SURE, NEVER use the interview. And then, we talked and I knew that it needed to be shared. Erin shares her heart and it is BEYOND beautiful, so just try to ignore that I talk WAY too much, don’t ask the right questions and laugh in all the wrong places. However, it is a RAW conversation between dear friends and one I am extremely honored to share with you today. Our conversation starts out by acknowledging how we met through the wonderful awkwardness of mom-dating and we chat about starting new friendships as adults! We also cover how everyone has different capacity when it comes managing friendships. Erin and I dive into her heartbreaking encounter with breast cancer and discuss in detail what the year following her diagnosis looked like for her and her family. She shared what it was like to open up to her community for help, and we hash out what it looks like to show up for people who are in the midst of the hard things in life. She talks in depth about what she has learned throughout her fight with the c-word. The second half of our conversation is an update on what life has been like living in the aftermath of her recovery from cancer. Erin shares what her new “normal” looks like as a survivor and gives us insight into the tools and resources she has found critical in to overall mental and physical healing from the trauma of cancer. This conversation is near and dear to my heart, having personally walked along side and witnessed the courage and determination Erin has embraced along her journey. I’m so very thankful for the conversation we shared and I feel confident that if the C word has touched you or anyone you love, this show will leave you feeling stronger and less alone. Her candid spirit and honest heart is an inspiration to me and I know will be to you too. There are SO many things that make Erin such a treasure. She loves to travel and is a pro when it comes to eating her way through a new city! Her laugh is contagious and her dance skillz dominate any disco she sets her foot in! As an ex fashion couture-house manager, current full time mama of three crazies and an aspiring interior designer, she spends her days wiping noses, rushing to yoga, studying mindfulness and helping curate her clients homes into beautiful and inviting spaces for everyone. She is my go to style consultant and a database of helpful resources when it comes to finding the perfect accessory for your outfit or your home! Erin loves laughing with friends and her deepest desire is to live in a world filled with loving kind humans. Her closet is lined with rows of impeccably organized shoes, and she will pretty much do anything for a taco. ALL. THE. TACOS. Her passions include meditation and the power to heal your body with your mind. After being sidelined with an aggressive breast cancer diagnosis at 34, Erin now vows to live everyday to the fullest. Which she admits sometimes means hiding from her kids in the closet during bedtime, passionately enjoying a glass of wine. She’s most likely to be seen sporting some fun nail art, an arm party, bell bottoms and a big ol’ smile. To me Erin is love, kindness and compassion poured out. She is the kind of friend I aspire to be and a continual encouragement to me in all areas of my life.